A slip which was stitched by Karen Ryan, a chapter member, for the Shenandoah Tapestry Project. The slip, along with others, will be mounted on much larger piece which depicts this area of Virginia as it was during the American Civil War to become the Tapestry. Please see our Gallery of Members Work for a larger photo of this and also other members' works. A break from stitching this month. Two years ago some of our members went to an exhibition in Suffolk of historic samplers. There was great interest and curiosity about samplers. Meryl was to give this presentation about the history of samplers last February, but the meeting was canceled due to snow, so it has been rescheduled. She will bring photos of some samplers from different periods as illustrations. Our individual sections are finished now, stitched together by our chapter president, the squares have been further embroidered and embellished by members and the squares have been stitched together. The piece (n progress below) is off to the Metro Region Seminar. The final piece will be in a silent raffle at the Metropolitan EGA Region's Seminar in April 2019 for the benefit of our chapter. 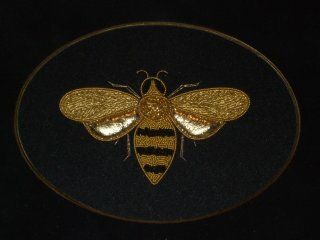 Our goldwork projects. Members are learning about the technique of gold work - stitching with gold thread and beads - by either stitching the "Golden Bee" (left) or the "Bejeweled Dragonfly". Part of the cost of the goldwork projects was a grant from the EGA Metropolitan Region. 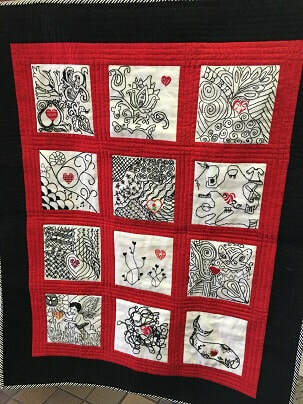 Heart and Zentangle is a project designed by some of our members for us. Different members each stitched a piece with a different red heart and self designed Zen design. The individual stitched pieces were then put together by other members into a quilted hanging. The finished piece was auctioned off at the EGA Metropolitan Region Seminar. The Long Island Chapter of the Embroiders' Guild of America is the local chapter for Nassau County in New York State for the Embroiders' Guild of America, Inc., a not for profit, educational organization offering study and preservation of the heritage and art of embroidery. We welcome members from outside of the County also. Members in the Long Island Chapter (LIEGA) meet monthly to learn about embroidery and other needlework. Skills are presented and taught by experts to enable a greater appreciation of needlework arts and the ability to increase one's skills from beginner to advanced. This site is here for the enjoyment of all! Please explore the many projects photos contributed by our members. Look at the exciting things that we have planned for this year. Consider becoming a member. Membership in LIEGA includes membership in the national organization, Embroiders' Guild of America, Inc.
We meet monthly on the First Wednesday of each month, September through June. Southern State Parkway to Exit 25N, Newbridge Road (Route 106) North. Take East Meadow Avenue past 1 traffic light - park will be on right. We welcome guests at our meetings. Please contact us in advance as occasionally a meeting may be canceled due to inclement weather. Some meetings may require purchase of supplies in advance or a kit fee at the meeting. No part of this website may be published, reproduced, stored in, or introduced into a retrieval system, or transmitted in any form or by any means whatsoever (including electronic, mechanical, photocopy) other than for personal or chapter/region use without written permission from the copyright holder.